This band is an interesting one, releasing just one album during their fairly short-lived career with very little success. Gruppo D'alternativa's sound could easily associate them with the IPR (Italian Progressive Rock) movement in the early 70's due to their similar styles with band such as Il Balleto Di Bronzo or Banco Del Mutuo Soccorso, but they also had a very experimental and odd style to them which can also compare them to the RIO movement active during the end of the 70's. Bands such as Stormy Six and "Desperate Straights" era Slapp Happy comes to mind while listening to this album, but whenever it was influential to those bands remains unknown to me. You could call most RIO dissonant and inaccessible, but Gruppo D'alternativa was a different story. 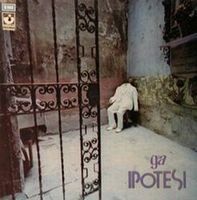 This album, while still heavily reminiscent of typical RIO stylistics, is also quite melodic and structured at the same time, therefore they are a bit difficult to categorise properly. I would still consider it as a "Proto-RIO" album of sorts, but also a part of the IPR movement at the same time.